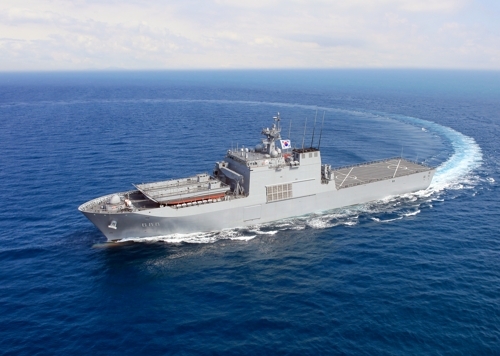 South Korea's Navy will take over a new 4,500-ton landing ship featuring speedier and larger-load operations on Monday, the state arms agency said. The Defense Acquisition Program Administration (DAPA) plans to hand over the Ilchulbong vessel to the Navy in a ceremony to be held at Hyundai Heavy Industries' shipyard in Ulsan. It will be the Navy's third Cheonwangbong-class landing ship (LST-II) following the Cheonwangbong and Cheonjabong vessels. They are named after mountain peaks in South Korea. We need better information on this ship. The article gives a PATHETIC loadout and I know it has to be better. Still it is interesting that in most navies in the Pacific the LPD (as its called in the US Navy) is still a highlighted ship and sought after. I don't think anyone is following the USMC's example and going "air centric".